Cloned from Struck by SymbioticDesign. Info: Created on Sat, 16th March . Last edited on Wed, 17th April. Originally, I went in to kern Struck, but before I did, as this is one of my eldest fonts, I decided trying to improve it. But then, I started noticing a nice little design I was trying to do, but wouldn't work with the overall design, so I cloned it and created a new font. But then, I started changing how I was wanting that one to look, too. So I created yet another clone... this one, Wackathetica. Now, maybe I'm crazy, but I cannot find the second clone. ??? 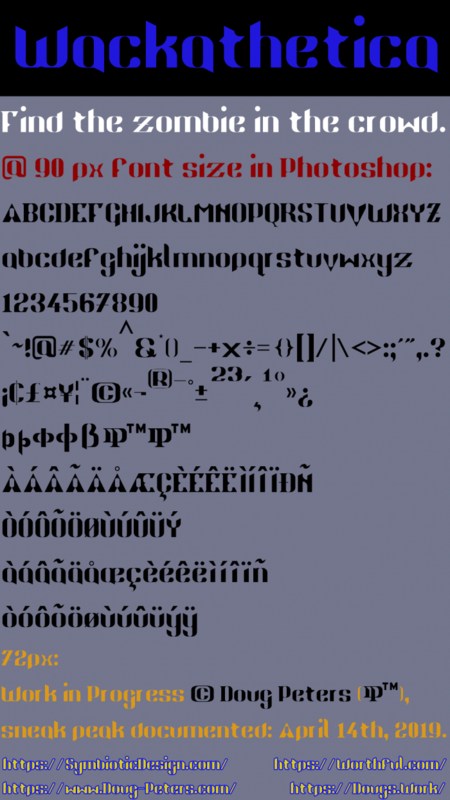 "Wackathetica is derived from , which is derived from Struck, all fonts created by Doug Peters." Only, I can't find it. So, maybe I am crazy. That is worrisome. Argh. Just as I hit retirement I start losing my mind. Just a note: Because there is such a large line space, or space between lines, I don't think this version of the font should be available for public consumption. It needs some tweaking in a font editor where I can control the line height and tracking. But before I get there, I want to finish the Latin Supplemental characters, plus I will kern it here, both things to accomplish here Fontstruct, first (and yet to do). Kern it. - Capital combos DONE. - Lowercase combos DONE. - Upper to Lower cases DONE. Add some more punctuation (DONE), currency signs (DONE) and symbols (DONE)... but I can add more later, let me know if you have any glyph requests. the A is really unique I like it alot. but i have to say i can't stand the colors in ur font sample. first, full black and full blue is really bad i hope ur owns eyes can tell. An easy way to solve this is simply unsaturate the blue. second, full white is a terrible color (imo), You can just make it a bit darker. LOL. No prob, @JingYo. I'll be in less of a rush with the next sample. That was just a sneak peak, anyway. I've already changed it a lot, but I want to kern it before I'm done. I'll try to pick a more pleasant palette next time. Does Cyan on Black look good? I would think so. But I think JingYo has a point. I was tired actually more interested in getting a simple character sample made, I wasn't really thinking about colors and most wound-up being inspired by my school colors (from a couple colleges). Oh well, that has been a criticism of my font sample images before, though I have a certain fascination with optical illustions and proving legibility of the font with a busy or psychedlic design scenario. I'll put more thought into it next time.